Chelsea boss Jose Mourinho does not think Sunday's Premier League fixture at Cardiff will be the last game for defenders John Terry and Ashley Cole. Terry and Cole, both 33, are out of contract next month and their futures, along with midfielder Frank Lampard, 35, have to be decided. When asked if it would be the duo's final match Mourinho suggested not. "I don't know but I don't think so. The club knows my opinion. 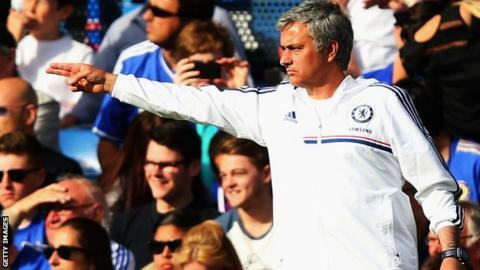 The players know my opinion too," Mourinho said. "I do my written reports to the board during the season and with the final report at the end where I try to have my point of view, analysing every aspect of the season." Lampard, is set to miss the trip to the Welsh capital through illness. Mourinho said "there is nothing to say" when quizzed on whether the veteran England international had already played his last game for the club. However, the Portuguese did suggest that Lampard's contribution has been so great that the club will one day erect a statue of him outside Stamford Bridge. "Maybe in a few years he will have a statue where Peter Osgood is," added Mourinho. "He's one of the biggest players in the history of this club."